I am deeply grateful to the Winston Churchill Memorial Trust that gave me a unique opportunity to gain knowledge and insights into yoga for disabled people in India. I travelled over 6,000 miles in seven Indian states where I meet and learned from some of the renown yoga masters and eminent educationalists. The highlight of my Fellowship was meeting Education Psychologist, Dr P. Jeyachandran, Director of Special Education in Tamil Nadu. We met at Vijay Human Services, a small school for special children in Madras (now Chennai). He greeted me with pleased surprise, because we had just learnt that we had both introduced yoga to people with severe learning difficulties around the same time, even though we were at opposite ends of the earth. His book ‘Teaching Yogasana to the Mentally Retarded’ (pub. 1983) showed me that we used the same yogasanas (yoga postures) with breath and relaxation. He told me about the facilities at his training centres, as the Director of Balar Vihar Special Education programmes for teacher training special educators, the children in special schools, and the parents of special children in day care. 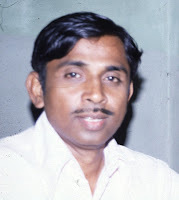 Six years previously in 1978, Dr Jeyachandran had initiated yogasanas (yoga postures) training for his special educators to teach small groups of special children as an experiment at Vijay Human Services. Two other educational psychologists assisted him managing this project in collaboration with the Krishnamacharya Yoga Mandiram, a yoga therapeutic centre registered with the Health Ministry. The following three videos show interviews with these three psychologists: Dr Jeyachandran, Ms Vimla and Ms Lata in their respective training centres, along with demonstrations of the special educators’ and childrens’ yoga training sessions. Note: At the time of my visit in January 1985 and up to quite recently, people with learning difficulties / intellectual disabilities were termed ‘mentally retarded’. In this report I will use the terms special child and children with learning difficulties, however mentally retarded is mentioned in the accompanying videos. Please allow 20 minutes for viewing these videos below, showing the unique yoga teacher-training programme, yoga being taught to groups in a special school, and the children’s pilot yoga class. Here I was invited to attend the teachers’ yoga training class. Both Dr P Jeyachandran and the Principal Ms V. Vimla greeted me warmly and escorted me into the long hall. Where four male teacher trainees were standing, and on the other side of a wall-divider about twenty female teacher trainees were, all waiting to start their weekly yoga class. The two groups inhaled during the expanding movements - which opened out their lungs - and exhaled to the sound of ‘ha’. I was very impressed with the beautiful atmosphere and unison of the groups. Every week for one-hour the teacher trainees were taught the next lesson on yoga. Their yoga teacher showed then illustrations of the sequence to practice, and at the end of the session they had to copy these into their exercise books. So they could continue practice on their own each day, and gain experience to teach the same yogasanas to the children the following week. At the end, some of the trainees told me of their personal benefits gained from the yoga practice such as: overcoming emotional problems with yoga breathing and relaxation; relief from severe back-ache caused by spondylitis; increased flexibility in hips; improved breathing and relief from chest infection; sense of enjoyment from the practice; and one man said he had considerable relief from various pains since practising yoga. I was thrilled by their enthusiasm and thanked them for allowing us to video their yoga training. Dr Jeyachandran further arranged for me to visit two special schools to see the effect the yoga training was having on the children. Ms Vimla the visiting psychologist introduced me to this opportunity section, and to Ms Sithar one of the special educators qualified to teach yoga here. Everyday for the past eighteen months she had taught yoga to children from the senior class, along with her junior class together. I was amazed to see during the session one of the girls faced the other children and started to instruct them to do Parsva Uttanasana (Crane) a rather difficult standing posture. She was able to articulate the instructions in time with the breathing, and the others all kept in time with her as they practised 6 times on each side. Most of the children had learnt to coordinate instruction with movement, and the remaining few who could not follow instructions were able to imitate the others. Therefore the yoga was helping the children in their concentration. Ms Sithar was very pleased with the daily yoga programme, and said she was also giving the same course to the parents. So they could continue the practice with their children at home, including the school holidays, and that this made the yoga much more effective! I was welcomed by Ms Lata the Principal of the school which consisted of two small classrooms and an office, where thirteen children attended for 5½ days a week. I learnt that the children spent the first half of the day using Western educational behaviour modification to teach them basic learning skills. Then shortly before lunch the programme switched to the ancient educational system of yoga that included practising yogasanas, chanting and listening to some mantra sounds, and dancing the Bharat Natyam. I attended several yoga sessions and each time made more interesting discoveries in the realm of yoga. On Saturday mornings a yoga teacher from the Krishnamacharya Yoga Mandiram teaches the children in an hours’ group yoga class. Two of the children’s teachers assist her, who subsequently teach the same yoga sequence before lunch during the following week. A Yoga teacher also attends the school one weekday between 3pm to 7pm to give individual 45-minute lessons to children who cannot yet join in the group sessions. A parent or carer accompanies the child so as to encourage practise at home. Ms Lata obtained the parents’ permission for us to film their children’s yoga classes. She directed us to the end classroom where five rush mats were arranged on t he floor and five boys were eager to start their practice. Their special educator, Mr V. Rajemdran held in his hand his exercise book containing stickmen drawings of this week’s yoga sequence, and conveyed the instructions in Tamil. Meanwhile Ms Lata explained briefly how the school functions and commented favourably on the children’s yoga progress. Three of the boys had been practising yoga regularly for the past four years. The other two had started one year previously, and they had some yoga tuition from the yoga teacher to catch up with the others. Two of this group, Joseph and Raju case studies were presented at the Indian Academy of Yoga in Bangalore, which are given at the end of this article. 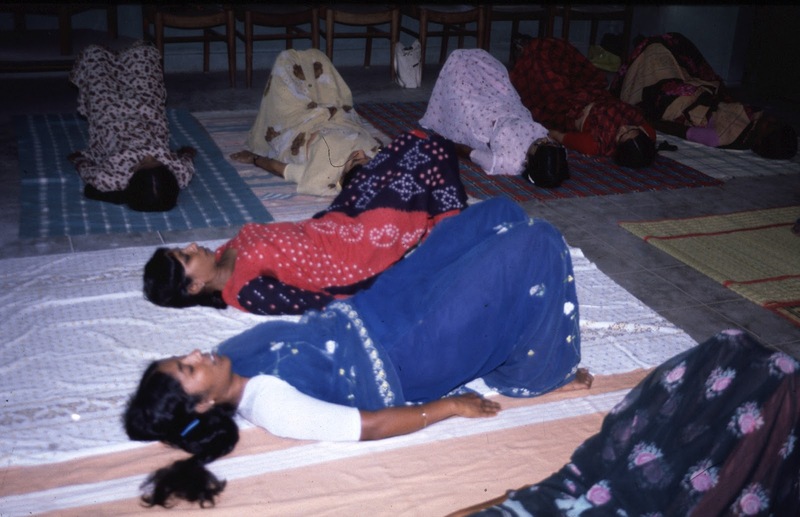 The staff, parents and inter-disciplinary team working with these children felt that Yoga had provided a means of reaching many of them, and hoped that further studies in this field, and feedback from workers continuing to provide yoga to these type of children, would result in improved methods and continuing success. By the Krishnamacharya Yoga Mandiram in collaboration with Vijay Human Services, 1983. The study was on yoga for special children (mentally retarded pupils). The aim was to train special educators to teach such pupils to practice yogasanas (yoga postures) and pranayama (breathing practices). Fifty special children and twenty-one special educators were chosen to participate in the project. The children were drawn from three schools and were selected on the basis of age and I.Q. Most of them were 12 years old and the average I.Q. was 52. All special educators were qualified teachers and had at least three months experience handling the special children. The educators were given 14 yogasanas and pranayama lessons over a period of 12-weeks. Following the first two weeks they were instructed to teach the children for 30 minutes a day on six days a week for the remainder of the course. To start Jeyachandran introduced the educators to their yoga teacher, who showed them diagrams of the yogasanas and pranayama techniques to be practiced in one-hour sessions. They were then asked, while practising yoga on their own for 30-minutes a day, to consider the methods they would use to teach the children. The third week each of them was deputed to teach the same yogasanas for thirty minutes to two or three children. In this way they gained knowledge and experience of yoga, so that the complicated problems they encountered during the training could be referred to the yoga teacher for elucidation. The teachers gained benefit from their own practice, and the change they could see in their own physical well-being encouraged them to look for similar results in the children. By the end of the yoga study programme Dr Jeyachandran was able to report to Krishnamacharya that the children had achieved an encouraging degree of proficiency in yoga, and the confidence this engendered helped them to learn new skills and to participate more efficiently in practice. Also their behaviour showed improvement not only in the motor training areas as expected, but in other areas as well such as: eating, dressing, behaviour, social interaction and language development. It was fortunate that Desikachar, the son of Krishnamacharya, was able to assist Dr Jeyachandran with the project, giving insight and confidence to the special educators. He also helped the course organisers to select suitable yogasanas, pranayama and relaxation techniques for the children, together with some of the teaching strategies used. On meeting Desikachar he said, “Yoga has given these children more interest and has improved their self-esteem and their attitude to their families and outsiders.” He was amazed and delighted that six years later, the yoga programmes were still being taught every week and also that the enthusiasm of the special educators was constantly maintained. Finally, over the years the special educators have continued teaching yogasana in different parts of India, and have kept Dr Jeyachandran informed of the progress their pupils have made. Two case studies presented at the Indian Academy of Yoga in Bangalore, by Dr P Jeyachandran and T.V. Ananthanarayanan from the Krishnamacharya Yoga Mandiram. Joseph was 10 years old. He was diagnosed with moderate learning difficulties (mentally retarded). He had a number of physical characteristics including: overweight, overeating, lethargy, a protruding tongue, wife open mouth, drooling, peculiar gestures, jerking or stiffening of the body every few minutes, walking with stiff legs, temper tantrums, loud crying and destruction of property. 6. Writing – to write his home and school addresses legibly. An expert member of the inter-disciplinary team, an orthopaedic surgeon, was then consulted on the problem of squatting, and advised surgery to relax the muscles. However, the yoga teacher on the team, in discussion with the parents and others, felt that yoga should be tried first, keeping surgery as a last resort. Hence, the decision was made to set up a course of Yoga Therapy for a period of three months, after which the situation would be re-assessed. Joseph was taught on a one-to-one basis. He was highly motivated, practising the yogasanas twice a day. In only a month he was able to squat, not too confidently, but sufficiently well to be able to go to the toilet independently. His tendency to evacuate in bed disappeared, and he became very happy at his ability to squat instead of standing. Soon afterwards he participated in the yoga classes with the other children, and surgery was ruled out, as everyone was content with his achievement. His weight had dropped considerably and he looked healthy. He was active and agile, with no lethargy, and a considerable reduction in the jerking and stiffening of his body. Most of the time he kept his mouth closed, drooling had almost stopped, and he kept his tongue in his mouth. In addition his walking had improved enormously. This may be due to his self-confidence he gained and the increase in self-esteem as his parents and siblings state his temper tantrums, loud crying, property-destruction etc., had all been considerably reduced. His hours of sleep had also increased, enabling him to attend school more regularly. Ms Lata and other inter-disciplinarians were confident that Joseph’s coordination in all the five priority goals had improved quickly owing to the regular and systematic yoga practice. Two years later, after we filmed Joseph practising Dvipadapitha (Bridge) and Salabhasana (Locust) which he did with both breath and body coordination. He sat comfortably on the floor with the other children eating his lunch, and he ate with his mouth closed and without dribbling. Ms Lata told me that he did not start any schooling until he was ten, yet he had already reached a high standard at Vijay Human Services. There was still a slight behaviour problem but that was due to attention seeking; otherwise Ms Lata was pleased to say that he was perfectly all right. 5. Toilet habits – to go to the toilet independently and squat there when required. Although every attempt was made to focus attention exclusively on one stimulus at a time, Raju was completely unable to perform any suggested action. Instead his hyperactive behaviour continued, along with his other unusual activities. As he could not follow instructions, no plan was made to introduce yoga. One day the special educator noticed that he was trying to imitate other children who were performing yogasanas with rhythmical counting. Because of this, he was introduced into the group and encouraged to perform the yogasanas. After a time, it became possible to teach him yogasanas on an individual basis, which was a great breakthrough. He continued to do yogasanas twice a day. There was general agreement that there was a continuing improvement in his appearance, noticed not only by his parents and others, by the school bus drivers too. However, occasional outbursts did still occur. Toilet – he went by himself, but could not yet squat. A good rapport was established with Raju. He did yogasanas willingly and the team hoped this would enable him to achieve other objectives. Although it was evident that the yogasanas were a primary help in reaching him, it was realized that further research would be needed before this could be established as a regular process for dealing with similar cases. YOU & ME Yoga trainers' coursework now involves doing three case-studies. To demonstrate the trainer's competence teaching the system to students with varying abilities. They must provide visual and written evidence of their carefully selected yoga programmes to safely accommodate each individual's particular needs and abilities, along with records of practice, achievement and evaluation. Here Pat Pickering, a YOU & ME Yoga practitioner talks about her yoga training with a very special client called Jane, which is followed by her case-study. Jane is twenty-six years old, has athetoid cerebral palsy and is quite intelligent. Most of the time she uses a wheelchair, but she enjoys the opportunity to sit in a normal chair. She is capable of sitting unaided. Her athetoid movements sometimes make purposeful movements difficult, but her personality is such that any frustrations are so slight as to be practically negligible. Jane always indicates when she wants to use the toilet, but requires assistance to get in and out of her wheelchair and to adjust her clothing. She finger-feeds when eating sandwiches, but needs to be fed with a spoon when having a hot meal. She drinks independently but needs to use a two-handled cup with a spout. Jane uses the Hydrotherapy pool and enjoys it, but this is only possible once a week. She is an active member of the Makaton sign language group, and is encouraged to use speech as much as possible when signing. Her vocabulary is limited and is sometimes difficult to understand. Although she understands most of what is said to her, it is wise to keep language simple when addressing her. She is a very enthusiastic, happy and lively young lady. During the first few weeks of introducing Jane to the idea of yoga we asked her how she felt about life in a wheelchair, and from this we were able to prioritize her future course of action. She told us she would like to sit up straighter and hold her head up. She has the typical extensor thrust of chin, and said she suffers from a lot of neck ache. She also told us that she hoped to gain more control of her arm movements, by gaining more strength in her arms and hands to assist with eating, drinking and using her Makaton signing. She said that toileting was a problem, because it was uncomfortable to be handled so much by various staff assistants, and she wants to work towards being able to pull herself up from her chair to go to the toilet without help. So together we looked through the YOU & ME Instruction Pack of the Postures. 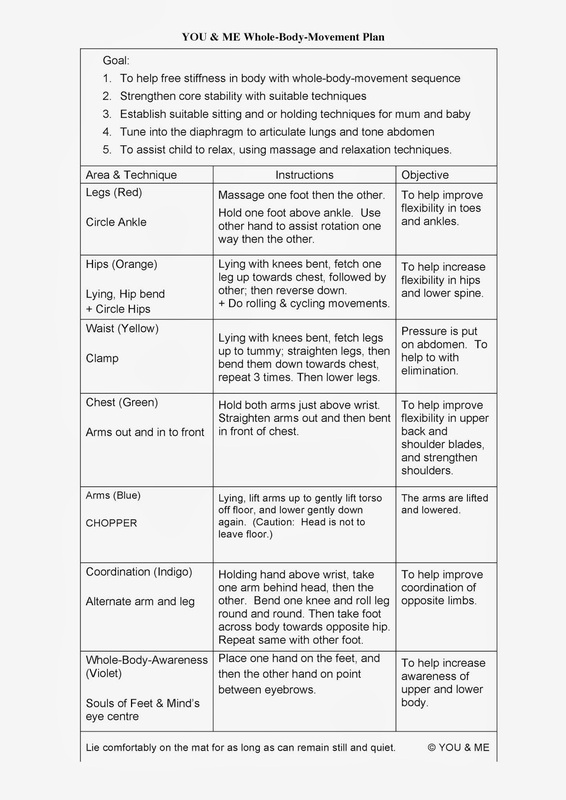 As Jane could understand the seven different coloured parts of the body, in relation to selecting one Posture card in each of the seven different colours, it was possible for her to contribute to selecting and arranging her own yoga programme plan. Jane made very good progress. She is always telling people what she can do, and they are keenly interested in her progress. Apart from progress with her YOU & ME Yoga, there has been evidence of progress with other members of staff in other learning areas. Jane is participating more actively and confidently in the swimming-pool. Her sitting position in her chair is more upright. Her biggest accomplishment is pulling herself from her wheelchair onto the toilet, and back again without needing to be lifted and handled at all, only her clothing needing adjustment. She is very pleased about this, and also about having starred in her own video, which was great fun for her especially when it was shown at home and all the family watched her on ‘telly’. Jane found breathing very difficult when we started the practice. 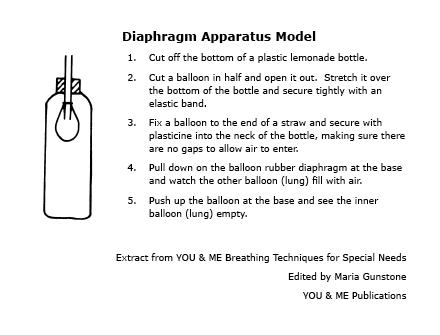 The first few sessions were spent discussing and practicing breathing with use of the diaphragm. It was important that Jane could see the tummy movements on the in- and out-breath. When lying down she couldn’t see this herself, so I lay down beside her with a book on my tummy so that she could see that the book was moving up and down as we breathed together. After some time, she was sometimes able to control and slow down her breathing. I demonstrated this process further by showing her the ‘diaphragm apparatus’ and helped her to see what happens to the lungs in relation to the diaphragm while breathing. 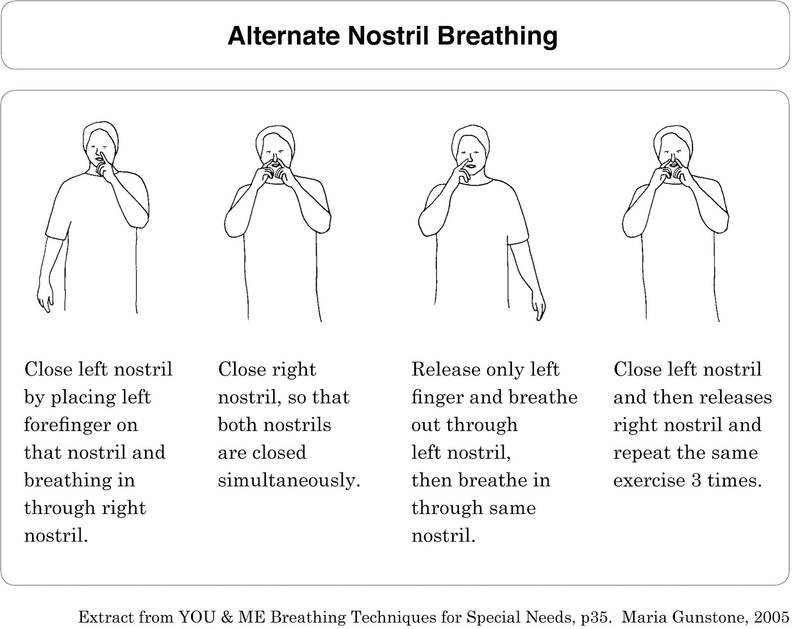 These breathing practices have been helpful with her Postures, because previously she would perform the Postures too quickly and with a jolt at times. And use of the ‘ahhhh’ when breathing out helped her to control her movements at a slower pace. After Jane completes her yoga sequence of seven Postures she spends ten minutes relaxing her whole body. This is a very important part of her programme, as she needs to relax and breathe easily. This in itself wasn’t easy for her, but the video filmed at our Centre showed how she learned to relax and breathe much better. 3. Steaming - Use a cup full of boiling water and breathe in steam for few minutes. Helps to lubricate throat. Note: Do not cover head in the boiling steam. 4. Breathing in with quick diaphragmatic (tummy) breathes. 6. Relaxation – Make sure do something everyday to help with relaxation. 7. Emotions – Try to be objective with emotions. 9. Do Not: shout, whisper, strain or clear throat. 10. Swallow instead of clearing throat. Have you ever suffered from problems with your voice? What helped you? Please comment on your ideas and experiences below. My speech cord granuloma condition was caused by shouting above a noisy integrated group of young students with their therapists/carers/parents. I honored teaching this YOU & ME Yoga course for this group of 20, when really I should have been tucked up in bed at home getting over such flu condition. I need to listen to my body’s warning signals to prevent potential serious consequences. If I don’t look after myself, I cannot expect anyone else to. Ignoring my cough, sore throat, struggling to speak and forcing my voice unnaturally was absolutely stupid. It is wrong to spread germs. As a result, I was left with a chronic speech problem and thought I would never be able to teach again. Within a few weeks I was diagnosed with speech cord granuloma and threatened with an operation to remove the granules with prospect of only 37% success rate. The oesteopath/cranialogist/healer Charles Tisdale of Dacrelands Clinic, Lancaster, where I had my office, told me to cancel the operation. To have instead weekly treatments of cranial sacral therapy and acupuncture, as well as homeopathy remedies, all of which I benefitted from. I contacted Swami Pragumurti of Satyananda Yoga Centre, London who told me to energise my throat by daily chanting the ‘OM’, the sound ‘Eee’, humming the sound ‘Mm’ and to do the Alternate Nostril Breathing which I enjoyed and benefitted from doing. In addition to chanting and practicing Alternate Nostril Breathing for 10 minutes everyday, I also practiced my yoga system involving a sequence of Whole-Body-Movements and Yoga Nidra (deep relaxation) for a further 20 minutes. This was my second time round of intense yoga therapy - with conviction - for a ‘new chance and lease of life’ since my serious car accident some 30 years before. Five months into my therapy, I wanted to know if my prospects of teaching again had changed. As I was feeling much less tensed when speaking and somewhat empowered by looking after myself with all the alternative treatments and yoga practice. So I went to see a private ENT (Ear, Nose, Throat) surgeon for a second opinion, who actually diagnosed no trace of any granuloma on my speech cords whatsoever. The consultant, like me, thought there being ‘no trace’ was remarkable. I did of course tell him of the alternative therapies I’d had and about my yoga practice. He responded by saying, “Your throat had healed because you had allowed it to be well.” Seemingly yet another lesson: to desire health and allow it to be so!